I recently had a chance to interview my favorite TV actor Mayim Bialik. 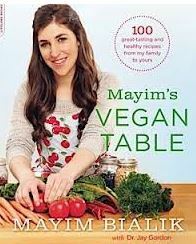 I was eager to speak with her ever since she has published her vegan cookbook Mayim’s Vegan Table, featuring simple and easy-to-do vegan recipes of delicious foods for anyone wishing to move toward a healthier plant-based diet. Besides being an Emmy-nominated actor, Mayim has a Ph.D. in neuroscience, which corresponds to the career pursuits of her current TV character, Amy Farrah Fowler, on the Big Bang Theory. She has two boys, aged 9 and 6. Yael: I really love your new book I can’t stop raving about it. I need to know what is your favorite recipe in the book. Mayim: Oh gosh, it’s hard, you know… There are favorites that I have that are easy and there are favorites that I have that are more complicated. Obviously, the Jewish recipes are sort of how the idea for this book came about. There is a recipe for vegan sufganiyot, which are a bit more labor intensive but I think it really works because Hanukkah could be a difficult period of time for a vegan. There is also the Hamentashen and the strudel. I also really like the chili, which is one of my stand-by recipes, as well as the vegan Shepherd’s Pie, which is something I make all the time for my kids. It is so hard to pick! I love the baked Ziti: it’s the one thing I always make if I have a lot of people coming over. Clearly, I have a lot of favorites! To read the rest of the interview and to see the sufganyot recipe, please click here.